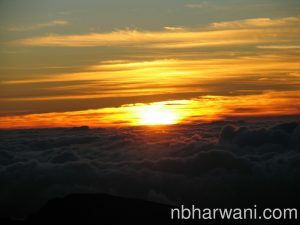 The most memorable day was spent at the Haleakala volcano summit (10,000 ft) to watch the most beautiful sunrise. 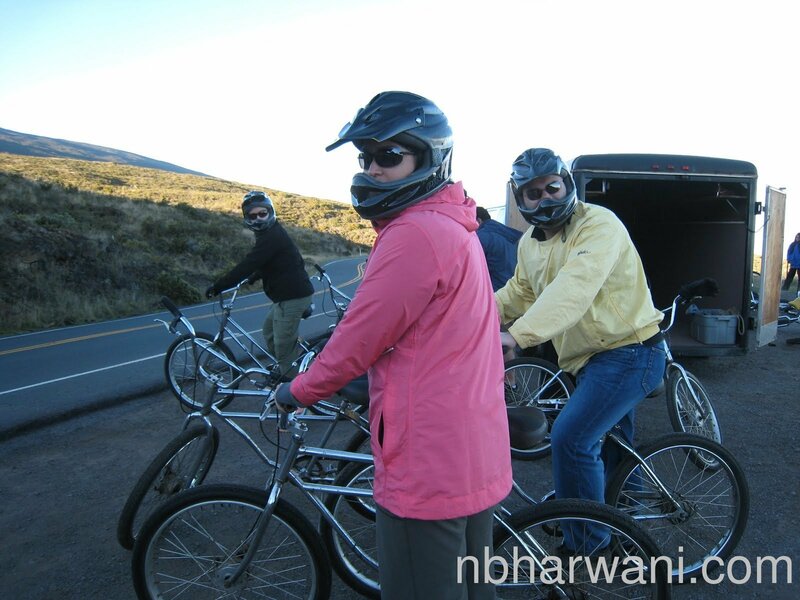 After watching the sunrise from the volcano crater at 10,000 ft. Alia (pink jacket), Hussein (yellow jacket) and the rest of the group get ready to bike down the mountain on Volcano Chrome Cruiser Bikes. The bikers riding down the mountain road under the watchful eyes of Sabiya and Noorali in the van – drinking coffee and taking pictures. We were back at the the Ka’anapali Beach Hotel to soak in the sunset. Then to the magic show: left to right — Noorali, Sabiya, Alia and Hussein “performing” magic. Taking a holiday is a wonderful thing. It takes a while to organize one but once you get there, you are glad you made it. That is how my family and I felt when we arrived at mid-night at our hotel in Maui, Hawaii. 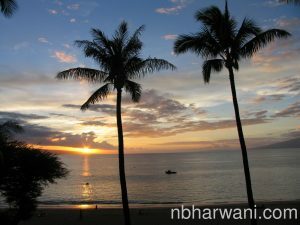 We stayed at Ka’anapali Beach Hotel (Hawaii’s most Hawaiian hotel). We had our rooms facing the beach. The sunset every evening was breathtaking. One can sit on the balcony all day to observe the interaction between humans, their pets and nature – sun, sand, water, waves, breeze and fluttering palm trees. The location of the hotel also provided an opportunity for long walks on the beach, with the presence of multiple shops and other hotels and restaurants meant you could just stay on the beach and get everything you wanted right there. This allowed my daughter, Alia, to continue with her early morning jogs and workouts while we were still in bed. We decided to take it easy on the first day to recover from the long journey. We spent our time at the beach, the swimming pool and the local village shops. We had lunch at Leilani’s on the Beach where they serve you a giant “killer” Hula pie as desert for free! In the evening, we had dinner at the hotel’s Tiki Terrace restaurant where Hula dancers entertained us. Other activities during the week included parasailing, zipline adventures from a base camp at 1,600 ft. elevation, and Kupanaha Magic Show Dinner Theater at the hotel. One evening was spent at Maui Theatre watching a show called Ulalena. The show takes you through the same journey as the Hawaiian people – from the creation of the islands to the early island explorers. Through their special effects you will visit volcanoes, vast oceans and primeval rain forests while meeting the Gods who rule each location. The most memorable day was spent at the Haleakala volcano summit to watch the most beautiful sunrise and then bike 28 miles downhill. 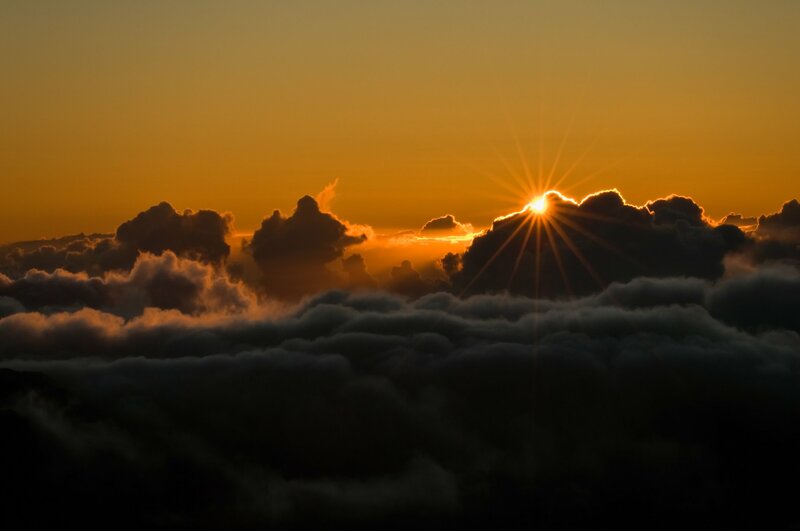 Early Hawaiians applied the name Haleakalā (“house of the sun”) to the general mountain. 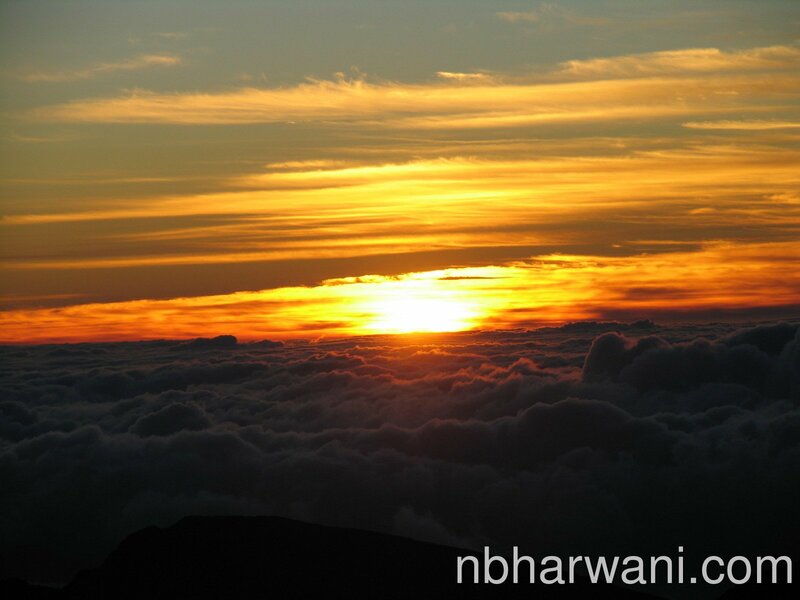 The tallest peak of Haleakalā is at 10,023 feet (3,055 m). 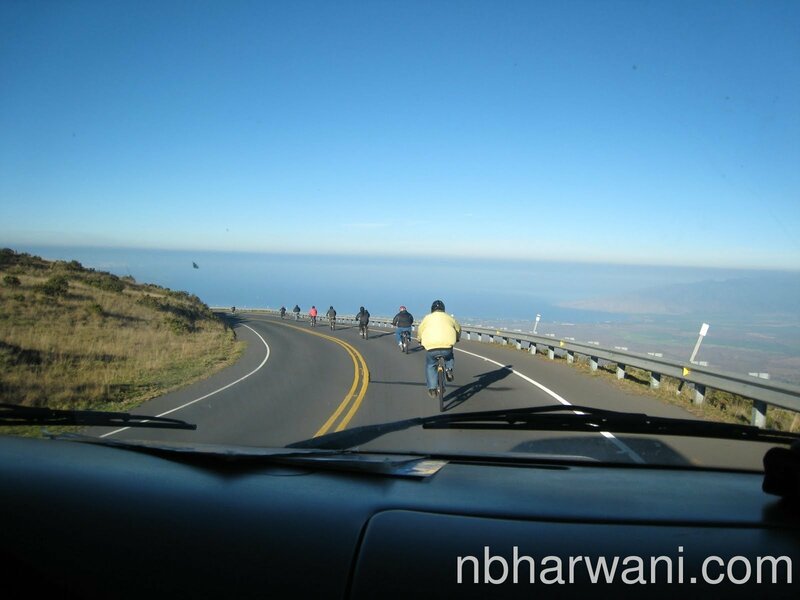 The drive to the summit is a two-lane highway containing many blind turns and very steep drop-offs. It takes about two to three hours to drive to the summit if you have no fear of heights. We decided to go by van as part of a guided tour. Pick-up time was at 2:30 a.m. at our hotel. A continental breakfast was provided before we started the journey. At the summit, it is cold (about zero degree Celsius) and windy. We were provided with warm overalls. Sometimes it rains and the clouds distort the view of the sunrise. We were lucky. No rain and the sunrise was beautiful. There were lots of people. After you have taken pictures it is time to leave. If you have the stomach to drive by yourself then you can stay as long as you want, hike around and visit the rest of the park. If you have a fear of heights or want to enjoy the view and let somebody else drive then take a guided tour. As the morning broke, we drove downhill about half way. Then we were given Volcano Chrome Cruiser Bikes and helmets. 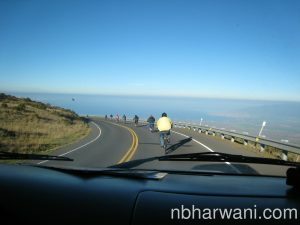 Hussein and Alia biked with the rest of the group while Sabiya and I took photos from the van. One thing we didn’t do is the famous Hana Highway drive. We had done it 15 years ago and had no desire to do that again as there was no time. We did visit Maui’s Winery, hiked the Maui Rain Forests and Waterfalls and spent an evening to have dinner and a show at Old Lahaina Luau. Our most memorable dining was at the secluded Mama’s Fish House and at Sansei Seafood Restaurant and Sushi Bar.